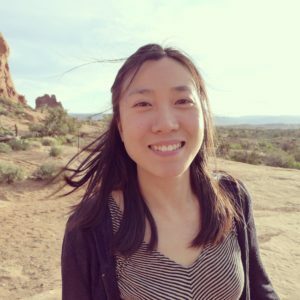 Hyonbin is a Ph.D. candidate in Literary Studies at UW-Madison, writing her dissertation on modernist long poems. She has been a Writing Center instructor since 2013, and currently serves as a TA coordinator for the Writing Center. She also moonlights as a translator of children’s and YA literature. Among the six OGEs, I had the pleasure of planning and leading the OGE “With, not for: Building and Strategizing Diversity in the Writing Center,” in which I wanted to think about diversity in the writing center from the instructor’s or administrator’s point of view. We often discuss diversity and inclusiveness in relation to students who visit the writing center, but diversity and multiplicity on the instructors’ side are also topics that should not be neglected. 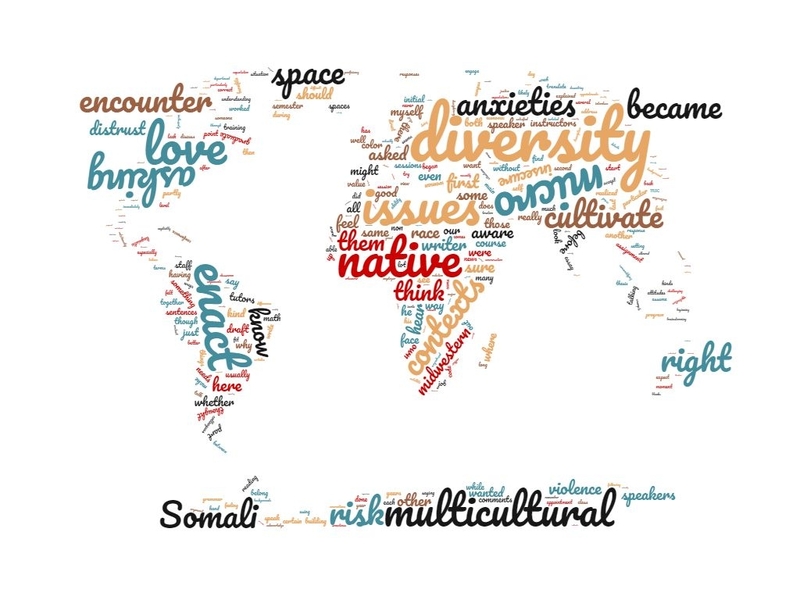 Multilingual and multicultural instructors often face skepticism and doubt, from both native and non-native English speakers. On the other hand, these instructors also have the resources and empathy to engage with students using another language or cultural perspective. At the same time, I also wanted to think about issues of strategizing this diversity from the administrative point of view, and also how to address it in relation to our careers. How do we address the strengths and challenges of building a more diverse writing center from within? Another question raised by Elisa, one of our participants: How do we enact diversity without commodifying it? Some subjects we discussed in our OGE could be largely divided into several sub-topics including: 1) What goes in a session such as code-switching/code-meshing, or the anxiety and skepticism students express towards non-native tutors; 2) Instructors, related to the above mentioned skepticism, the implicit assumption that non-native instructors are not good at certain aspects, the issue of hiring a diverse pool of instructors, how racism affects work as an English instructor, in particular; 3) the space of writing centers, such as tutors of color or international tutors in the main center, or white tutors in MSC locations, whether space encourages or discourages diversity, and whether writing centers are relatively “safer” than classroom settings to be more experimental, to enact diversity. Another topic raised by Elisa, one of our participants: How do we enact diversity without commodifying it? We didn’t really reach any conclusions, but had open-ended conversations on these issues. We then decided to each write a short reflection on our topics of interest, and workshopped them during our second meeting. Below are contributions from the seven participants of our OGE in the following order: “What Is Your Qualification?” by Dipo Oyeleye, “Empowered by Negotiations: Working through Skepticism as an International Tutor” by Hyonbin Choi, “Adjusting Our Expectations,” by Zach Marshall, “Confessions of a Monolingual Tutor: Writer as Resource,” by Calley Marrota, “Where We Are When We Do What We Do” by Leigh Elion, “Do I belong here?” by Minhee Kim, and “Evaluating Our Motivations” by Elisa Findlay. On my first day as a writing center instructor, I had a student that I had taught “Masterpieces of African-American Literature” as a freshman. He came to the center with a draft of his job application. On seeing me, we exchanged pleasantries, and afterward, he asked if I was the writing center tutor. He also asked if I had done it before. He wanted to be sure I was qualified to give expert advice on his cover letter. Before taking up this job, I haven’t had a situation where someone calls my credential into question. Well, I managed to answer his questions with mild irritation. I got over it, and we got down to working on the cover letter. He was grateful, pleasantly surprised and I could sense he felt embarrassed for doubting my competence. I thought that would be an isolated occurrence. However, on the same day, the second student who was applying to graduate school started the session with asking, “What is your qualification?” This time, I realized that there is something different about the writing center. There is an expectation that students bring to the space. It seems they don’t expect non-native speakers of English as tutors. It also seems as if the ideal instructor has to be white and all-American. Before drawing this conclusion, I had asked several other colleagues on staff, and they usually expressed surprise or acknowledged the familiarity of the situation. Most of them, though, often responded that they have never had their qualifications questioned. I also thought it was an isolated case with white students, but I soon realized that even international students, who are non-native speakers, often look disappointed when they realize their instructor does not fit the description they had expected. In retrospect, I have had to think about why students expect their writing center tutors to be native speakers of English. First, the subject of discourse is English. Even though the students are bringing course materials from various fields, the medium of transmission is the English language. There is, therefore, an expectation that the expert should be a native speaker, who is knowledgeable about the intricacies of the language. Of course, native speakers do not look or sound like Asians, Africans, and Middle Easterners in their imagination. Hence, the encounter with a tutor that doesn’t fit the description is a cause for concern. Second, the center is a more intimate space. The student has a limited time to get help with their material. In a one-on-one interaction, the student wants to be sure that the tutor is indeed “qualified” to get the job done. While the students’ concern is unfounded, as staff members undergo series of professional training to work at the center, it is important to emphasize the advantages of having a non-native speaker tutor. More often than not, a tutor who is an international graduate student comes in with a rich perspective on meta-language, proficiency and their use in broader contexts. This experience could be particularly beneficial to students who think in other languages before writing in English. I also believe the professional training of staff should include some of these challenges that international tutors encounter. It would prepare them to deal with the kind of situation that I highlighted in this piece. 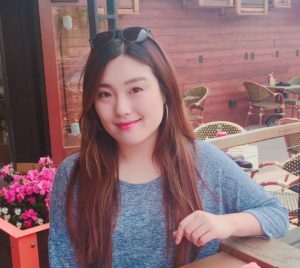 As an international student from South Korea in the English department, I have worked as an instructor in intro-lit courses, English composition classes, upper-level English major classes in literature, and also the UW-Madison Writing Center. Before starting work as an English instructor, I was warned by both other international students working as TAs and also colleagues in the English department, that as an Asian woman, I would face more challenges in establishing authority or building credibility than say, a white male instructor. In the following years, I did face these challenges and more, so when I started working at the writing center 2 years later, I felt like I was pretty much prepared for the best and worst. Working as an instructor in the Writing Center, though, was surprisingly better than working as a course instructor, but not because I didn’t face those same challenges during writing center sessions. In fact, the initial negative responses at having to work with an instructor of color or an international instructor were much more immediate, direct, and open than in a classroom setting where it is present like white noise, mostly humming in the background. Right when I introduce myself as the tutor, I would get hints such as “Last semester, I worked with a native speaker because I need help with English,” or nonverbal responses like looks and facial expressions. I’ve also had a couple of students asking whether I get paid to do this job. These more open and direct comments occur partly because writing center sessions are more intimate, one-on-one relationships, and partly because grad students coming to the writing center are aware that fellow grad students work at the writing center, and are less likely to find writing center instructors as authoritative. One of the things I also found interesting was that I often faced skepticism and doubt from non-native English speakers more so than native English speakers, because they wanted a native speaker to look over their draft, especially when they are graduate students. They feel like they are experts in their own field and writing, and want help primarily with “sounding academic,” or grammar issues. However, writing center sessions were empowering for me because I could work through those challenges within the short timeframe of 30 minutes to an hour. I can’t say I feel good about the initial negative responses, but in a way it was cathartic to actually face them rather than having those thoughts hang about in a passive-aggressive manner. Even following direct requests that they rather wanted to work with a native speaker of English, once we start the session, I could see the initial doubt and anxiety melting away when we began discussing their papers, and especially when I start making comments and suggestions about their papers. The five-minute waltz is how I think about the first part of such meetings. We go back and forth, cautiously exploring each other, until we latch onto a common ground of understanding. Of course there are also instances when things just won’t work, but once we get over that initial barrier, I can tell that they begin to accept me as a writing center instructor, often leading to having on-going appointments with them. 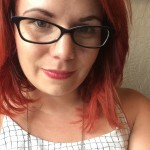 It is only recently that I realized it was this process of negotiation that allowed me to first acknowledge and accept anxiety on the students’ end, and also empower me at the same time to gain confidence as a writing center tutor and an international student in a PhD program in English literature. I myself experienced doubt and skepticism over my own writing, my presence here in the States, and I can relate to the anxiety students have over their writings and also toward me. Confronting the doubt and anxiety of students, negotiating with them, and together working beyond those issues have given me a chance to confront my own anxieties as well, a chance to overcome the macro and micro aggressions I face as an Asian woman in America. On a closing note, I wonder how this could translate over to a classroom setting, where it is more difficult to pay attention to each student at a time. Also, the level of commitment is different for each student, and it might be difficult to reach a common ground with everyone. I invite thoughts on this matter! As a white, native-English-speaking, male tutor, my experience of teaching in the writing center is often the reverse of what I’ve heard my colleagues describe who do not identify in all the same ways. While some of them talk about the initial distrust students feel toward a multilingual instructor, I look like the person writers expect to get help from, and when I start talking in a Midwestern dialect of American English, I usually confirm those expectations. For me, thinking about how I can be better at encouraging diversity in the writing center takes two forms. First of all, what do I do when I work with a writer who expresses low confidence in his ability to write in English? 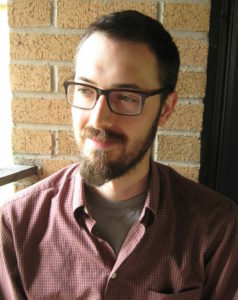 They know that patterns of errors or a few missed articles might completely change an instructor’s perception of their intellectual ability (see Ben Rafoth, Multilingual Writers and Writing Centers, 109). I’ve learned to build up writers’ confidence by pointing out how savvy at writing they already are because they’ve done the work of learning to write in a second language (see post by Jessie Reeder). I don’t necessarily do this right away – sometimes it seems too quick or defensive. I like to point their knowledge out when we’re talking about the details of writing: “Aha, see? You already know how to identify adverbs and adjectives, and that’s not easy!” Sometimes, I ask them to teach me how a certain construction works in their language. I’ve learned a lot: Chinese doesn’t distinguish between singular and plural in the same ways English does; grammatically correct “que” clauses in Spanish don’t always translate into correct sentences in English; Somali uses mood markers in sentences that simply don’t translate. Being interested and acknowledging real difference has helped to demystify the task of writing in another language. Second, I’ve learned that I need to respond to the moment of recognition as the “right” kind of tutor. Responding is necessary, especially for my white, native-English speaking students who too often say things to me like, “I’m so glad you’re my instructor because I can actually understand what you’re saying” or “I’m doing really bad in my class because I can’t understand what my Mexican/Russian/African/Chinese professor is saying,” a comment which they seem to inevitably justify with “None of us in the class can understand her.” They think that because I look and sound like them, I understand how hard it is to have to learn from someone who doesn’t talk or write the same way I do. As problematic as these encounters with native-English writers are, I realize that I need to do the same for multilingual writers, because they too can help to change expectations about who should teach in the writing center. Here’s a response I often use: I point out that while many native-English speakers have the ability to speak the special native-English codes (using articles correctly, for example), many of them lack a nuanced understanding of grammar or the metalanguage to talk about language, like many multilingual folks possess. In fact, in terms of thinking about whether international instructors belong in the writing center, it might be unfair that native-English speaking instructors are not expected to have a complex understanding of grammar or patterns of error. Cynthia Linville, for one, argues that tutors will need more than just native knowledge of English to be successful tutors (“Editing Line by Line” in ESL Writers: A Guide for Writing Center Tutors). (On the other hand, I also believe patterns of inequity within the English-speaking world complicate potential expectations about who should know grammar.) Native-English status too often passes as language expertise, when the two are different. Confession: I’m not sure I’m fully satisfied with these responses. Especially since my response deflects rather than directly addresses the racism many students express. Education about who really belongs in the writing center is certainly necessary, but we also can’t neglect that a lot of what fuels our skewed expectations is good old fashioned prejudice. As a monolingual tutor, I have been looking for ways to engage and extend the linguistic and cultural knowledge of multilingual writers. While I believe that cross-cultural writing experiences cultivate vast linguistic and cultural awareness, I have struggled to invite writers to apply this knowledge during tutoring sessions—partly because I cannot engage with writers in multiple languages and partly because I do not want writers to think I assume English is not their first language. Recently, I was lucky enough to work with a writer who helped me understand how I could use my tutor training to elicit writer’s knowledge and experience regarding cross-cultural writing practices. During this particular session, we began to discuss the writer’s essay assignment and their thesis in particular. When I explained that I considered a thesis as an argument or a claim you are making, they shared that, in their home country, arguments were structured differently. I began to probe: What exactly did they see as differences? Why did they think those differences existed? In response, the writer explained not only how arguments worked differently but how the writing conventions may be connected to cultural expectations. They thought that one reason they were hesitant to state arguments directly was that, in China, their home country, it would be deemed rude to be as explicit because humility and understatement are cultural values. With these distinctions in mind, the writer was able to better articulate a thesis in contrast. At the same time, I was reminded that I could not assume that terms like argument are self-explanatory concepts. Rather, I needed to explain what I understood argument to mean from my particular experience with argumentative writing in the United States. When we came to the end of our conference, I began as I usually do, by asking the writer which part of our time together was the most helpful. They said it was most helpful to learn about expectations for argument, that in the U.S, they may be expected to use a more explicitly argumentative claim than they were used to writing. In addition, I thanked them for teaching me about different argument structures and contexts, explaining how much it would help me work with writers in the future. This experience helped me understand how I can use my tutor training, particularly around asking questions, to elicit information about students’ experiences with languages and cultures and to use these experiences as resources in our conversations about writing. Although I envision writing center sessions as collaborative sites where mutual learning happens, I often lose sight of what a writer is teaching me because I am so focused on helping them. This experience reminded me of the linguistic and cultural resources writers bring to sessions and the fact that I need to ask about them in order to learn. I recognize, however, that asking questions about language and cultural background is different than asking questions about disciplinary knowledge because it runs the risk of making writers feel as if they lack linguistic proficiency. Although I think, given the opportunity, all multilingual writers could be as reflective as the writer in this session, not every student will be as forthcoming. I find myself further wondering how (and if I should try) to activate this kind of reflection when it is not initiated by the writer. For the past several semesters, I’ve taught in the Writing Center’s satellite location in the Multicultural Student Center, which is located about a block away from the main center, on the second floor of the Red Gym. The MSC describes its mission as using a social justice framework to “collaboratively strengthen and sustain an inclusive campus where all students, particularly students of color and other historically underserved students, can realize an authentic Wisconsin Experience.” One afternoon last semester, I had an appointment with a student who was working on an assignment for (I think) an intro-level Gender and Women’s Studies course that asked students to apply readings they’d done for class to a story they’d read in the news. They had been reading about systemic racism, and she had chosen to write about the then-recent shooting death of Keith Scott in North Carolina. She was just beginning her assignment and wasn’t entirely certain how to bring concepts together, so she wanted to do some brainstorming and planning together. I don’t know whether she was a first-year student, whether she’d never been to the Writing Center, whether she was uncertain about the course material, whether she wasn’t sure what my politics would be, or whether she thought I would know more about her topic than she would, but she seemed to lack confidence in talking about her chosen news event. She would often trail off at the ends of sentences, waiting for me to fill in the blanks for her. As she filled me in on her plans, she told me, “I’m writing about this man, Keith Scott… do you know about him?” Often, in these kinds of situations, even if I know something about the topic at hand, I feign ignorance and ask the student to explain it to me; this can both generate some usable text and help students to take ownership over their own ideas. 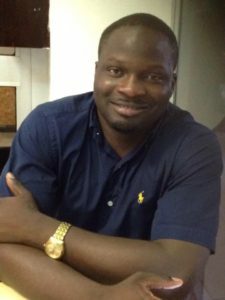 I had indeed been reading about Keith Scott in the news, but I told the student, “I’m not sure – will you remind me?” The student quickly filled in the blanks, I scribbled some notes, showed them to her, and pointed out how by filling me in on the context of the shooting, she had essentially written her own introduction. We continued brainstorming the rest of her essay this way, and the student left feeling confident that she could execute a draft. Had we been in the main Writing Center space, I’m not sure I would have thought anything of this moment, or that I’d remember this appointment so clearly. However, the moment I announced “I’m not sure” and asked for a reminder, I became immediately, viscerally conscious of my surroundings. I don’t harbor delusions of grandeur about students in the MSC space eavesdropping on my conferences, hanging on my every word, but the fact that I was a white woman instructor talking to a white woman student, sitting in a space dedicated to students of color and to inclusivity, announcing that I couldn’t remember the details of a national news event about violence done to black bodies, seemed to really matter, and it put into focus some anxieties that I have about the ruptures between the kind of solidarity I try to practice with students of color on campus and about my position as someone ostensibly in possession of some kind of authority over writing and the writing process. How does teaching in multicultural spaces sharpen pedagogical commitments to access, inclusivity, and justice? How – or should – this approach to pedagogy change in these kinds of spaces? As a representative of the Writing Center, to what extent am I a symbol or an embodiment of authority over “good” writing? What is the relationship between writing support or instruction and writing authority? What kinds of narratives about writing authority does it reinforce to have instructors of a particular race dedicated to teaching in multicultural spaces? In other words, even though I am experienced and (I hope) thoughtful instructor, am I the right fit for this space? How do we address questions of staffing both in multicultural spaces and in the Writing Center at large? How can we make sure the writing and learning needs of students of color are met without reinforcing narratives about student deficiency? How can we make sure that we develop programming to meet the needs of these students in a way that honors their voices but doesn’t ask students, staff, or instructors of color to shoulder the burden of this program development? 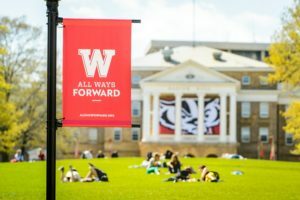 Before transitioning myself to UW-Madison, I attended another institution for two years, working as a graduate assistant at Math & Writing Center. Defying the stereotypical view on Asians, I was never good at math or science. Instead, I have been fascinated by the English language and how it reads and sounds since early teens, which eventually had me on a 14-hour-long flight from Seoul to the Midwest in 2013. While working as a writing tutor at Math & Writing Center, many visitors would immediately assume I’d be a math tutor because I look Asian. Now I’m here in Madison, working as a writing center instructor, again. This time, the workplace is dedicated solely for ‘writing’; it’s unlikely that I have to deal with such hasty presumption anymore. Anyone who walks into the Writing Center wouldn’t have any other choice but accept me as a writing instructor. The misjudgment issue is gone, but I would still feel insecure and worried from time to time. As a second language speaker and writer, I have to admit that I feel self-conscious when I produce English in a formal setting, and I realized that this feeling gets especially stronger when I’m working at Writing Center. I constantly monitor myself in order to produce utterances without grammatical flaws with the ‘standard’ accent, so no one would doubt or judge my quality as a writing instructor. The reality is, however, that I do generate broken English more than I wish, I don’t even know how many syntactic rules I’m violating, and it’s inevitable to hide my accented speech – a string of words with a bunch of ‘r’s and ‘l’s makes me sweating. Above are some actual questions and comments that I have received from writing center visitors over the year. I know most asked out of pure curiosity without any intent to embarrass me, and it’s not like I get hurt or offended (after all, they were right; I’m a foreigner), but they have made me question and ponder my identity as a Writing Center TA. Do I really belong here? What am I doing here, for what, and for whom? Will I ever be able to blend in? Do I want to blend in? What does it mean by blending in? Should I explicitly say I’m an international student in the beginning of each conversation and ask for their understanding and tolerance? From where do I get my authority? What do they mean by my English is good? Should I be happy to hear that? Am I competent and capable enough to teach writing as an L2 writer? What if I’m not? These questions had been stuck in my mind for quite a long time. There have been, of course, situations where I felt rewarded and empowered by successful sessions. However, whenever I didn’t feel as content, I would find myself attributing the factors to my far from perfect command of English. I really needed something to boost up my confidence and give a reason to stay. Then, it happened at the main center sometime during last semester. She asked, carefully reading my face. At first, I hesitated to shift the language from English to something not-English; I wasn’t sure whether I was allowed to do so. As we all know, a great number of bilingual writers visit both our main center and satellites, and English is likely to be a less dominant language for many of them. Just like I feel less sure and self-conscious about my performance in English, I assume it would be the same case for them. A simple ‘hi, how are you?’ routine might be stressful for some. Perhaps, describing the nature of a writing prompt in English might be challenging for them; moreover, clarifying and justifying why they made certain choices in writing might be even more challenging. Some might shut their mouth or pretend that they understand because they’re shy or afraid to be judged by their varieties of English. I was hesitant but, at the same time, glad when she asked if she could discuss matters with me in Korean, because I understood what she was concerned about. I wanted to help her, so I said yes. Relieved to speak in her mother tongue, she expressed very clearly what her instructor wanted her to do and why she chose to draft her paper in a certain way. Then we naturally code-switched back in English after she read the draft, but whenever she couldn’t find the right word to express something, I let her code-mix in the middle of sentences. She came back several times throughout the semester and she let her Korean friends make appointments with me who had been feeling uncomfortable visiting Writing Center before. Even though I work only one day a week at a satellite location this semester, I occasionally see Korean students sign up for an appointment and ask me if I am the one who speaks Korean. And I say I am the one. It’s priceless to see their faces as they heave a sigh of relief. It almost feels like I have a new assigned identity as a writing instructor. I now know I belong here; I know why I belong here: to serve a wider range of writers’ needs. I am a writing instructor who can code-switch and code-mix. I am the participant that Hyonbin mentioned in the introduction who, in our group discussion about building and strategizing diversity in the writing center, raised this question: How do we enact diversity without commodifying it? This question was motivated by an experience I had as a writing center tutor last year, when I worked with numerous students on their application essays for an undergraduate program on campus. One of the required essay prompts asked students to reflect on the importance and value of diversity in the context of their potential future professional lives. Response after response described the value of diversity in economic terms: a diversity of backgrounds and ideas would result in the newest and best innovations and, thereby, the highest capital returns. When students weren’t considering diversity’s value in explicitly economic terms, they were describing it in self-congratulatory terms (with definite economic implications). For an employer, for example, the value of fostering diversity would be in demonstrating their own benevolence and social conscience (which would then make them the kind of employer with whom customers would want to do business). Both approaches treated the concept of diversity as a product in which to invest—and a safe investment with financial benefits for the investor. Writing centers obviously have a different relationship to profit than the kind of employers being considered in these student essays. However, problematic attitudes about the value of diversity—attitudes which are disingenuous or self-serving—can certainly creep in. When we seek to cultivate diversity in writing center spaces, we need to thoughtfully consider the underlying attitudes which motivate these efforts and abandon assumptions and actions which commodify diversity and center the needs/benefits to the institution over the needs/benefits to the student writers and tutors themselves. Thanks so much to everyone who wrote portions of this post. Each piece has given me so much to think about, and I really appreciate everyone sharing their perspectives! 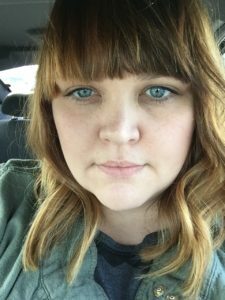 I am a peer writing specialist at a small four-year college reading this blog for one of our own trainings (how meta!). As a child of immigrant parents who used two different versions of non-majority English, and growing up around even more versions, I cannot say how much I appreciate y’all’s discussion. I specifically have been thinking about the concern around diversity and its commodification. Since the start of my institution diversity and inclusion have been a priority. However, because such notions are a large part of the campus they are often associated as perks and selling points to investors. More recently, when the question or topic comes up on how writing centers can strive for genuine diversity I often return to the empowerment which can take place by working with students. Empowerment for both tutors and tutees through an understanding that diversity is more than an addition to a majority, more than a box to check, it is embracing the disruption of homogenous systems and the voicing of marginal identities. Allowing voice means that we look to others and ourselves to become authorities on our perceptions and experiences especially as it relates to one’s identity. Practicing voice does not mean that perceptions are infallible but rather are given the opportunity to be expressed and shared. to help clarify identities. By embracing notions of disruption and voice when it comes to diversity, moments that may overtly self-serve a writing center or institution are positioned to be interrogated. Personally, my own interests have been looking into how such mindsets can be maintained in a writing center and it seems that much can be obtained from reflective practices and questions which would ask tutors and tutees to interrogate their writing as it fits in multiple discourses. When we consider if we need to prompt such reflective confrontations the answer for me is yes. To not create space for reflection is to maintain the acceptance of a homogeneous discourse and society. And in maintaining such practices, genuine diversity is silenced. I understand that for some such questions are difficult, especially when others (individuals or institutions) may not welcome disruption or confrontation to systems which have been deemed appropriate. Once more, thank you all for sharing, and more significantly voicing, your many perspectives in the writing center. Many thanks to the writers of this post. We are using it in our Writing Center training this week as the starting point for discussions about identity in the Writing Center: for our newly-hired tutors, this will be the first WC discussion of identity; for our experienced tutors, this will build on conversations we’ve had in earnest since 2016. If they are so moved, some of our tutors may post comments here, as well.